A commentary at flagship German online daily FAZ looked at a recent study by the German Umweltbundesamt – UBA – (Federal Environment Agency) which examined the per capita consumption of natural resources by different population groups. Not surprisingly, high income groups were found to own a large number of cars and live in large homes with energy-guzzling appliances – thus making this group of people large consumers of energy. Also the study found that the “urban, academic young classes who tend towards voting for the Greens have far above-average CO2 emissions per capita” and these emissions “are not offset by them buying vegetables from the local region in the organic shop”. The FAZ writes that the study found that this particular class — who are worried about the CO2 emissions and the climate — have “an above-average number of frequent flyers” and like to take long-haul flights to distant places like “New Zealand or Canada to admire nature”. The UBA study also found that traditional working classes (whose lifestyles the Greens often complain about) in fact are energy modest and fly less frequently. The FAZ also mentions former Vice President Al Gore’s film “An Inconvenient Truth”, where he “praised his ‘CO2-neutral lifestyle’ and claimed he compensated for his air travel. But later it was exposed how Gore’s 10,000 square foot mansion in Tennessee consumed “about twenty times as much energy as the house of an average American family”. “The green-preaching politician was a hypocrite and a Pharisee,” the FAZ commented over Gore. “those with a ‘positive environmental attitude’ had the highest actual energy consumption.” Hypocrites? Or just a slave owner attitude? Can you explain to us how that would work? How would people in Africa be pushed below the poverty line when Germany increases its carbon taxes? Way to go with strong language … I think you have it backwards. Instead of promoting cheap energy through hidden subsidies payed by the whole society, we should make the true costs of energy transparent. If the endresult is higher prices for energy, so be it. If someone is so poor in this country that he/she can’t pay the very low prices than we should do everything to improve the persons situation by improving the income situation, not by subsidizing prices for the poor. P.S. : The percentage of the income the average German household pays for energy (especially electricity) is still lower than in many other European countries. Maybe that’s one of the reasons why we aren’t outraged about the high prices for electricity here? One of the commentators here wrote that he pays hundreds of dollars for electricity per month. That’s almost an order above what my household pays per month … despite probably having more than double the kWh-price. Pricing is always relative! It is a sad fact of life that using taxation to reduce consumption will always end up hitting the poor- and only the poor. The rich will simply pay up and carry on as before. Subsidies for things like warm clothing, better bedding and improved home insulation are much more likely to be effective in reducing energy consumption without hitting the poor. Usually taxes on consumption (or generation in this instance) hits those who consume more than those who don’t. Also CO2 taxation is not meant to reduce energy consumption. It is about changing which energy gets consumed. Of course it would be easier to achieve this if energyprices would reflect the true costs already. Then why is wind and solar – which require backup from reliables (coal, natuaral gas) – strongly preferred over nuclear – zero CO2 emissions – by the we-must-save-the-planet-by-eliminating-CO2-emissions believers? Nuclear has its own problems, one of which being massive costs and some unsolved problems with waste management. Germany decided to not pursue this further. They don’t. Since they (coal, natural gas) already exist they can perform that function today, but that’s not the endgame scenario. Seems to work fine and CO2 emissions for the grid were down this week because the “backup” that was always running before (decades ago) didn’t have to run. Where is the problem with using this “backup” while phasing it out over the decades? Why don’t you engage with the author on FAZ to challenge his comments? Asking for readers of this blog to back up the statements made by somebody else seems like you’re just looking to put your name up in pixels. Well, Pierre repeated it here without reflecting on it. I am challenging him. He surely knows how that would work if he is repeating it here … right? To be extra clear: I am not asking readers of this blog. Misinterpreting my comment this way is kind of impossible, so how and why did you manage to do that? Countries in Africa that are members of the Paris Accord are effected by the dictates that the more affluent European countries make. The African countries are asked to not use the most cost effective coal energy and to build the renewable energy that costs them more. Energy cost goes into every product increasing the price it is bought for. This is called Price distortions. If a product can be made using lower cost energy the retail price is lower. Just as that same product paying a higher price for energy increases the retail price. Typical SebH misdirection. Obviously, high energy taxes only on Germans would have no effect anywhere but in Germany. From the wording in the article, those advocating high taxes on energy appear to be advocating it for everyone everywhere, including already impoverished peoples. Otherwise, what would be the point? The only way that could be a “solution” would be if one’s goal is to make others miserable. More proof that activists have no concern for anyone but themselves, and their misplaced sense of self-importance. Have to pick this up. Yonason, a sane mind would argue that the fossil fuel industry with all their lobbying and useful you-know-whats like you present yourself here, are the ones trying to make everyone miserable. At this point I really wonder what made you the kind of person you currently are? Did you hurt your little toe on a solar panel? Did a “greenie” take a parking space from you driving an EV? Have you been indoctrinated by someone to post this much nonsense all the time and especially directed at me? This seems to be about more than a person’s electric bill. Insofar as extremely poor people do not have a lot if discretion regarding their per capita consumption of natural resources, anything that causes their costs to go up, will quickly and directly impact the poor. With these sorts of issues, it helps to know some very poor people. Well paid politicians will never notice. The issue here isn’t high energy prices. It is that a rich country allows people to get into a situation where paying 25€ instead 20€ for electricity becomes an issue of life and death. Using the poor as an argument against fixing what’s wrong with energy consumption is a pretty weak strategy, don’t you think? Electricity should be made at the lowest price that is profitable for the supplier. All this subsidy BS is just politic and Marxism by the backdoor. What exactly is wrong with electricity being at 10€ instead of 20€? Ok, so let’s stop subsidizing fossil fuels. Let the consumer pay for all costs involved and not society as a whole. Same for nuclear power plants. At least renewable costs are pretty transparent in Germany. Energy/electricity is not as cheap as what you pay on your bills my troll friend. Ok, so let’s stop subsidizing fossil fuels. Fossil fuels are subsidized mostly in Middle Eastern and developing countries. Developed countries heavily subsidize wind and solar. Perhaps you can convince Iraq and Saudi Arabia to stop subsidizing fossil fuels. As usual SebastianH you are just blathering out troll nonsense because you’ve nothing substantial to say on the subject but apparently you feel you must have the last word. Yes the usual SebastianH nonsense and more thinly disguised personal abuse. What is wrong with an electricity price reduction from 20€ to 10€ ? You appear to be utterly against the customer and their needs and wants. A need for an electricity grid system that highly optimized for the efficiency and keeping cost low whatever the weather. There is quite a lot wrong with pushing up the price just because the wind and solar generator cause systematic inefficiency (which the do) that customers have to pay for it. 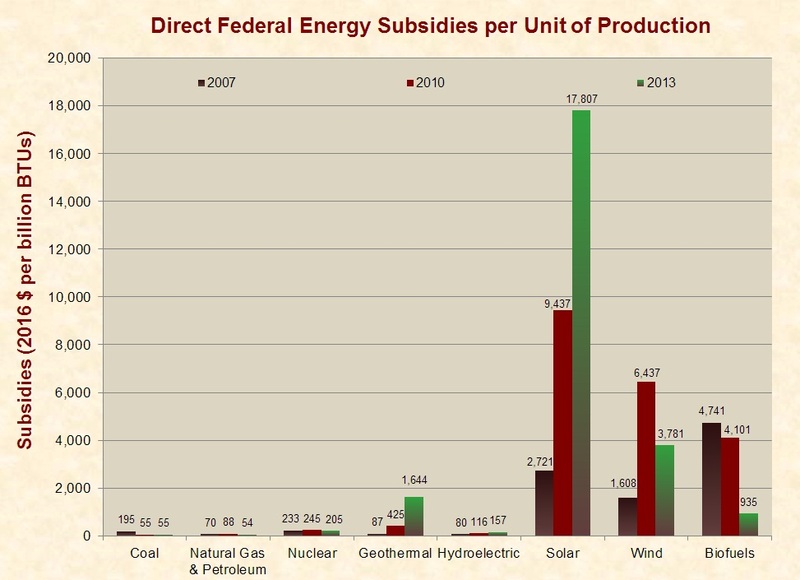 I know I’ve posted more than once on what SebH gets wrong about subsidies. But he keeps getting the SAME things wrong. Why, it’s almost like it was ….deliberate. So, what does SebH get right about RE’s? Virtually nothing. 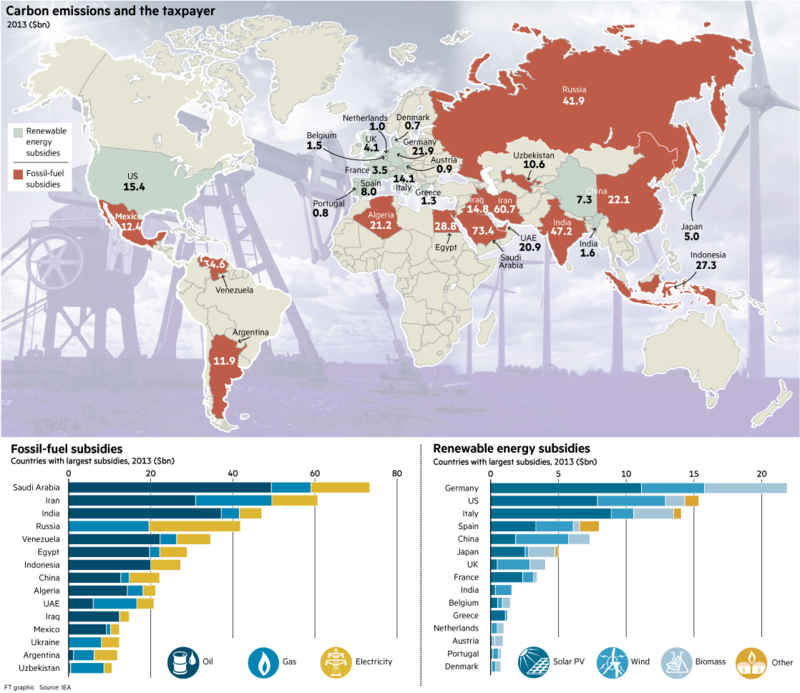 Fossil fuels are subsidized mostly in Middle Eastern and developing countries. By now you should know that I am not talking about that kind of subsidies (the ones where someone pays an amount of money to make the usuage cheaper). We are subsidizing the use of fossil fuels by socialising the effects they have on health, the environment and ultimately the climate. One could argue the use of fossil fuels also enables us to live healthier and better cope with climate change, but one could very well use other sources of energy to achieve the same effect, making this an empty argument. As usual SebastianH you are just blathering out troll nonsense because you’ve nothing substantial to say on the subject but apparently you feel you must have the last word. What is wrong with an electricity price reduction from 20€ to 10€ ? What is wrong with free electricity? Let’s make that happen! A need for an electricity grid system that highly optimized for the efficiency and keeping cost low whatever the weather. The whole point of transitioning to a more sustainable energy generation is to keep the costs low. The total costs, not just the raw costs of generating electricity. But you seem to be fine with funding exploration with tax money, taking care of waste with tax money … hell, why not pay the workers at a power plant with tax money to make electricity from fossil fuels cheaper? For the total costs it doesn’t matter who has to pay them, they will always have to get paid by someone. Same answer as to Kenneth. By now you should have noticed what I mean by subsidies … not only direct subsidies in form of money to make something cheaper. I’ve posted this more than once as well and you still fall back to this “see, I am right, because I have no clue what my opponent is talking about” scheme. It doesn’t work … well, it might with simple climate skeptics folks, but not with me. We are subsidizing the use of fossil fuels by socialising the effects they have on health, the environment and ultimately the climate. So if you’re not talking about actual (policy) subsidization of fossil fuels, but hypothetical negative effects of “socialising” fossil fuels, then specifically what are you proposing when you write that we need to “stop subsidizing fossil fuels”? Where did THAT come from? What is it, and why does he think it’s relevant to anything we’ve been discussing? What a tangled mess of crazy-over-normal he is today. I am proposing to put all costs on the electricity bill. TomOmason suggested electricity should be made at the lowest price possible to be profitable. If the price doesn’t include all the costs then it is a subsidized price. Doing that would level the playing field. Yonason, “never go full retard”! To reply with a movie quote. This post must be one of the lowest points in you online life. Clown away, grumpy internet person. No it’s not lost on me that you troll most of my comments. This is because I deliberately construct my comments to be, as far as I can make them, reflective of what is known and what is uncertain. In contrast you only offer unsubstantiated theory, guesswork and nonsense. You ask “What is wrong with free electricity?” only a child would think of such nonsense. We adults understand that you can not get something for nothing. What is wrong with an electricity price reduction from 20€ to 10€ because of improvements in efficiencies by removing (publicly subsidized) wind and solar from the mix? “The whole point of transitioning to a more sustainable energy generation is to keep the costs low. “ But it is a demonstrable failure as price and CO2 levels have both risen. And also if you factor-in the manufacture of all the components that make-up the wind and solar technologies then they are not ‘sustainable’! In contrast you only offer unsubstantiated theory, guesswork and nonsense. Everyone is entitled to an oppinion I guess. I assure you I feel the same way about you and your unreal certainty about many things. You’ve demonstrated a solid lack of knowledge about German electricity prices and what they are composed of. I don’t know why you want to remove subsidies only on the side that bothers you though … why are you ok with subsidizing fossil fuel or nuclear power by socialising many costs, but go on the barricades when the costs for renewables are included on the individual bills? One could have done this with taxes as well. Then German electricity prices would be much lower … why do you think this is a better approach? But it is a demonstrable failure as price and CO2 levels have both risen. What? Prices for renewables have decreased massively because of subsidies and CO2 emissions have not increased from using renewables. I know you mean the total price of energy and the CO2 levels, but I don’t know why you expect renewables to have “solved” this already at a share of a few percent of the total energy consumption. I guess you also think EVs failed already, since they are still expensive and the majority of the cars aren’t EVs yet. Right? At what point did you think flat screen monitors have succeeded? At what point did refrigerators achieve that? Still using rotating disks to store data on? And also if you factor-in the manufacture of all the components that make-up the wind and solar technologies then they are not ‘sustainable’! Why do you think those aren’t factored in? They produce many times the energy that is needed to produce them, thus they are sustainable or in case of some not-recyclable material at least more sustainable than burning fossil fuels for energy. With as much as he wants to give people for free, they’ll soon go broke. He and Occasional Cortex would be a perfect match for each other. Each thinks they have all the answers, yet neither has a clue. Two children who will never grow up. Very sad. As to his response to me…. Maybe instead of insults, he could respond to my criticism of his red herring? Naaaaw. That would be too out of character for him. And you SebastianH appear so confident (and pompous) enough about the absolutes in your cAGW CO2 theory. However the way clouds scatter EM radiations (light and heat) are NOT known by first principles — it is assumed to follow some experimental ideas, mixed with much ad hoc guesswork and many unexplained adjustments. Take a look here start at 46:30 — https://www.youtube.com/watch?v=hjKJyn_uoIE questions and answers — then go back to the start and learn about real basic fundamental physics (if you can). You might then understand that your version of radiative physics (and the IPCC’s) are not good enough! The fundamental physics has yet to be completed. As usual SebastianH you are just wrong in your assumption and distorting what really happens to fit your narrative. But overall you again FAIL to answer the question. Instead you bather on about me not understanding when you do NOT show this to be so. Just more over-inflated ego huffing and puffing (aka BS). Why can you not answer the question? But it is a demonstrable failure as price and CO2 levels have both risen and SebastianH offers no evidence that this is not so. Just more SebastianH BS. “What? Prices for renewables have decreased massively because of subsidies and CO2 emissions have not increased from using renewables.” which is why some Germans are in energy poverty and why German electricity prices are amongst the highest in the world. Otherwise you opinion on the matter is just more SebastianH BS. If there was any evidence to the show this you would readily offer it but as you only offer you opinion on this matter then I’m obviously correct and you are BSing again. It is your idea SebastianH that electricity could be free or didn’t you write — “What is wrong with free electricity? Let’s make that happen!” — at SebastianH 14. March 2019 at 1:45 PM ? have “an above-average number of frequent flyers” and like to take long-haul flights to distant places like “New Zealand or Canada to admire nature”. And that is because of what has been wrought in Germany by none other than the fake green idiots plying their handy work, the fools. 30,000 wind turbines hanging around occupying space and doing nothing is an embarrassment and nobody really wants to see anything like it, especially the fake greens. If you want to see beauty, the Canadian Rockies has it all. Guaranteed, Banff and Lake Louise will not have a single wind turbine anywhere near the place. A wind turbine standing in the middle of Lake Louise would be the the last straw. It is what I want to see the most of all, when the fake green idiots from Germany stop for the four night stay at Lake Louise, I want them to see one single wind turbine standing in the middle of Lake Louise for them all to see, the flicker of the wind turbine against the backdrop of the distant glacier will be the epitome of beauty all gone wrong. Then they might get the picture, maybe. If there ever was a hell to pay, that would be it. I won’t hold my breath or stand on one leg. I won’t have to, there won’t be a wind turbine on Lake Louise, ever. A period of decline in Iceland, with disease, famine and a volcanic eruption in June 1783 reducing the impoverished population from 50,000 to 35,000. The Iceland Laki volcanic eruption caused a drop in world wide temperatures. Temperatures in eastern U.S.A. in 1783-84 dropped 4.8°C below the 225 year average. Europe also experienced an abnormally severe winter. This was the largest lava flow, 14 cubic kilometers, since the 935-940 eruption in Iceland of 19,6 cubic kilometers. An extraordinary dry fog extended over Europe and parts of Asia. The good old days of the Little Ice Age.